A former Navy Seal officer who lost his eye in Afghanistan had the opportunity to show his Captain America inspired glass eye to the real deal recently. 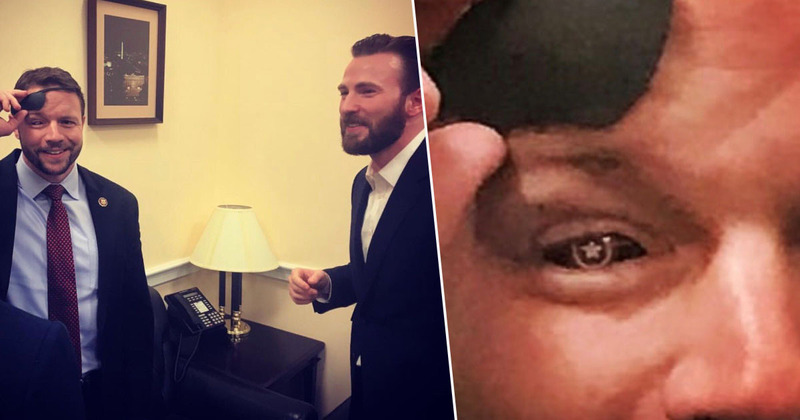 Congressman Dan Crenshaw bumped into Captain America himself, Chris Evans, in Washington D.C. on Friday (March 8) and didn’t miss the opportunity to show the actor how much of a fan he really is. The former Navy Seal turned Texas congressman made the most of his opportunity when he spotted Evans, taking him to one side and showing off his super-heroic glass eye. CNN reports that Crenshaw, who represents Texas’ 2nd Congressional District, was on his third deployment as a US Navy Seal in Afghanistan in 2012 when he was hit by an IED blast – resulting in the loss of his right eye. After recovering, Crenshaw was deployed twice more before he was medically retired four years later, in 2016. But rather than dwelling on things, the congressman decided to make the most of his situation and jazzed up his glass eye with a Captain America theme. The glass eye resembles Captain America’s shield, with the design of a white star in the middle surrounded by circles. And Evans clearly appreciated the former Navy Seal’s creative streak as he replied straightaway to Crenshaw, retweeting him and giving the eye his superhero seal of approval. Crenshaw wasn’t the only politician Evans met with while in Washington; the 37-year-old actor also posed for a picture with Tim Scott, South Carolina’s Senator, who made reference to the Avengers in a tweet he posted after their meeting. Great to meet @ChrisEvans this morning and talk education, workforce development, criminal justice reform and bipartisanship. Thankfully, neither of us turned to dust at the end. And if you want any Endgame spoilers, Scott’s the man to go to as Evans hinted he spilled the beans on the upcoming Marvel movie. Although, maybe not because I doubt anyone wants the Avengers actor to dissolve into a cloud of dust. We’ve had enough of that happening to our favourite superheroes recently, ta very much.